RAINER BÜRCK studied piano and composition in Stuttgart and electroacoustic music in Nürnberg, with Wilfried Jentzsch. He also studied musicology and philosophy at the University of Tübingen. He currently works as a freelance pianist and composer. As a pianist, he concentrates on contemporary repertoire and has premiered numerous works from several countries. 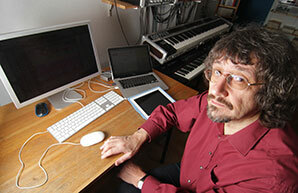 Since 1995, he has focused on collaborative improvisation projects. Rainer Bürcks recent composition has emphasized electroacoustic music, creating acousmatic works, and works for performers & interactive electronics. His music has been performed and broadcast in Europe, North & South America, and Australia to critical acclaim including 1st and 2nd prizes for Flautando (1999) at the Prague Musica Nova Competition and the Hungarian Radio EAR Competition. Rainer Bürck s CD Without Fear is available from www.earsay.com. Festivals: Barber Festival, Birmingham, UK (1993); City University Electroacoustic Music Festival, London, UK (1993); Festival Musica Verticale, Rome, Italy (1993); Huddersfield Contemporary Music Festival, Huddersfield, UK (1993); Askekte Festival, Salzburg, Austria (1994); Biennial Symposium on Arts & Technology at Connecticut College, New London, USA (1995, 1997); Dresdner Tage für Zeitgenössische Musik, Dresden, Germany (1996); SEAMUS Conference, Kansas City, USA (1997); Florida Electroacoustic Music Festival, Gainsville, Florida (1997); FIMU Festival Belfort, France (1998, 1999, 2001, 2004, 2006, 2008, 2010, 2011, 2013, 2015); Brazilian Symposium on Computer Music, Rio de Janeiro, Brazil (1999); International Computer Music Conference in Berlin, Germany (2000) and Gothenborg, Sweden (2002); NYYD Festival, Tallinn, Estonia (2003); Soundings Festival, Edinburgh, UK (2013); New York City Electroacoustic Music Festival (2015); BEAST Feast Birmingham (2017); INTERIM Festival Grabenstetten (2017); ASPEKTE Festival Berlin (2017); AFEKT Festival Tartu and Tallinn (2017); 5.Saarbrücker Tage für elektroakustische und visuelle Musik (2018). Further performances at many venues in Germany, Estonia, Italy, France, Great Britain, Canada, USA. Czech Radio "Vltava", Czech Republic; Radio Campus 92.2 Dijon, France; Radio 91.8 FM Kolomna, Russia; Radio Neva-3 104.4 FM St.Petersburg, Russia; Radio Ultra 70.19 FM, Moscow, Russia; Radio Deutschlandfunk, Germany; Südwestfunk Radio, Germany. Workshops: Hochschule für Musik und Darstellende Kunst, Stuttgart, Germany; Musikschule Dortmund, Germany; Pädagogische Hochschule Ludwigsburg, Germany; University of York, UK; University of Manchester, UK; University of Edinburg, UK; University of Aberdeen, UK; Queens University, Belfast, UK; University of Bristol, UK, Sussex University, UK; Eesti Muusikaakaademia, Tallinn, Estonia; Berklee College, Boston, USA; University of Vermont, USA; Concordia University, Montreal, Canada; University of British Columbia, Vancouver, Canada; University of Louisville, USA; Luther College, Decorah, USA; University of Nebraska, USA; Technische Universität, Berlin, Germany; Heino Eller Music College, Tartu.